Recent statistics may indicate a slump in the Hawaii and Maui weddings market. Recent information showing the number of marriage licenses issued between 2004 and 2007 are concerning wedding companies, especially here in Maui. It looks like the boom years for weddings in Maui have ended and very recent figures paint a bleak portrait for the future. For example, there were 746 marriages in Maui county in November 2005, compaired to 170 marriages in November 2007. This is a drastic loss and has caused wedding company operators in Maui to study their options, and get part-time jobs, hoping that the situtiation will improve in the Spring (as it typically does). "You just have to be able to weather the storm and have enough staying power to make it to the next up turn", said Tim Clark, President of Hawaiian Island Weddings, Inc. at their Corporate office in Kihei, Maui. Google Trends also indicate that fewer web surfers are searching for the terms Hawaii Weddings and Maui Weddings. 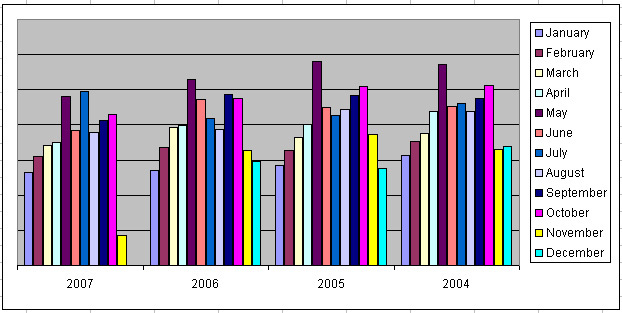 Actually, there were 2159 fewer Maui weddings in 2007 compaired to 2004. At an average of $25,000 per wedding, this equates to a revenue loss of 54 million dollars for Maui County alone. Not only are wedding companies and vendors concerned, but hotels, restaurants, and activity & tour operators are also feeling the crunch. What is causing the slow-down? It's thought that the downturn is just an indication of the health of the US economy as a whole. President Bush's "Stimulus Package", designed to jump start the heart of the US ecomony, may not be enough to generate the extra income to bring couples to Hawaii to be married as they did in 2004. Hawaii is expensive, and is one of those luxury items that are first to go during an economic recession. More and more wedding couples are choosing to be married at home, and honeymoon in less expensive places like Mexico or the Caribbean, where their tourist dollars buy them similar experiences for less money. Hawaii leaders need to study this downturn, especially with the economy in it's current fragile state.